The Digital Methods Initiative, the New Media Research Group at the University of Amsterdam, is holding a one-week workshop, RWPop, to map the issue culture of right-wing populist parties and fringe groups across Europe. It is a cross-cultural mapping exercise (over 20 European countries), whereby we seek to explore and compare right-wing populism and its fringes country by country, asking the larger questions, how populist is the fringe, and how fringe are the populists? In order to do so, we would like to derive the common and divergent agendas and substance of the right and the fringe, characterise their larger matters of concern and profile their media interests and styles. In the mapping exercises to be performed at the workshop, the language of populist parties on the ballot are compared with each other and with that of groups on the fringe, in all countries under study. Which parties and groups share each other's issues, and which are highly specific? Apart from pinpointing common and divergent issue agendas, we are interested in how to characterise the larger cosmoses, or ideological programs. To what extent do these groups use the language of heritage, rights and other panoramas that might not be thought compatible? How to describe how the new populists and fringe groups each phrase and blend issue languages? Finally, we are interested in the manifestations, materializations and expressions of such agendas and cosmoses in everyday (media) culture. How to create fringe and right-wing populist online media profiles? What are the interests and favorites? We are interested in accounts of their use of media, including social media, but moreso in their referenced books, music, videos, movies, television shows and brands. We would like to characterise the right's media (and particular media as populist, fringe, etc. ), using online mapping methods and techniques. The workshop kicks off with a lecture series on right-wing populism in Europe, on the first day, where we explore right-wing populism and fringe ontologies (where are the differences?). We also hear about populist portrayals in media, populist lifestyles and cultures as well as counter-populist programs. The talks are followed by a week-long series of mapping sessions, which ultimately concluding with final presentations of actual maps, or mappings. There is a general methodological program to be followed in the week-long workshop, whereby (generally) we explore the claims made and findings presented by the subject matter expert talks. In order to do that, participants harvest data from the web, analyse it and visualise it, employing tools from the Digital Methods Initiative and elsewhere. We present our mappings at the end of the week, when the experts are asked to return, and provide feedback and further insights. The workshop concludes festively. The issue mapping workshop, RWPop, is supported by the Open Society Foundations, and proceeds from preliminary undertakings at Goldsmiths College, University of London, during the Issue Mapping week, as well as the project, Mining Populisms, conducted at the 2012 Digital Methods Summer School, Amsterdam. Among the countries included in the mappings so far have been the United Kingdom, France, Germany, the Netherlands, Belgium, Norway, Denmark, Sweden, Finland, Estonia, Latvia, Lithuania, Poland, Hungary, Greece, Turkey, Macedonia, Bulgaria, Russia, Belarus, Ukraine, Spain, Portugal, Serbia, Bosnia and Herzegovina and Kosovo. The original distinction between populist parties and the fringe draws from Time Magazine's media portrayal. Digital methods is a program of research into how to repurpose online tools for social research. More specifically, by digital methods are meant algorithms and other counting techniques whose inputs are digital objects, such as links and website response codes, and whose application pertains to, but ultimately moves beyond, the study of online culture only. Digital methods is also a program of study and research, with M.A.-level courses, annual Winter Schools and Summer Schools, ongoing PhD research and international collaborations. Generally, the corpus or sources to be studied consist of populist party and fringe group websites, including populist party platforms in the native languages. 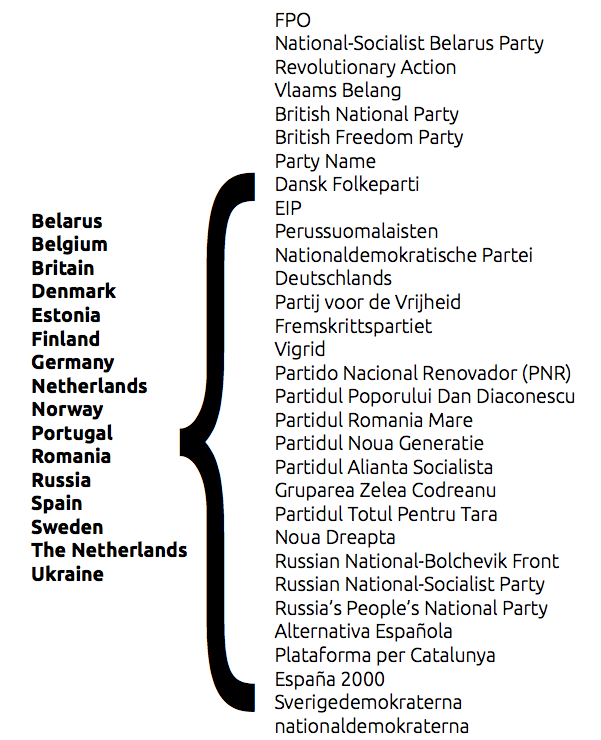 (Certain northern European populist parties provide platforms in both the native language as well as English, whereas southern European parties tend to have the platforms only in their own languages.) Certain of the elements of these websites are mapped and clouded. In the clouding, for each source issue keywords are extracted, translated (where necessary) and counted. Issues are resized according to mentions, both for each country as well as all of Europe, producing a kind of mother issue cloud of European right-wing populism. Additionally, both simple relational analysis as well as more involved textual analysis are performed on the data sets so as to enable more outcomes (maps), listed below. Also the websites are crawled, and hyperlinks are extracted, so as to be able to provide larger network maps of right-wing populist and more fringe groups across Europe. Other elements and objects to be extracted from websites (including social media) are images, book references, movies, brands, etc., so that a media cultural profiles may be created for each country and for Europe more generally. 4) Right-wing populist issue agendas per country 5) Right-wing fringe concerns per country populist country clusters, indicating central and peripheral themes as well as parties/groups. The workshop is a Digital Methods Initiative production in collaboration with Political Science at the University of Amsterdam. The opening session, Populism: Ontologies and Representations, is organised by Madeleine Moret. The mapping workshop organisers are Saskia Kok and Natalia Sanchez. The workshop director is Richard Rogers. There is a reader to accompany the workshop, which is to be distributed three weeks prior to the workshop, together with the welcome package, including the schedule.